By Tali Krakowsky . Published on March 18, 2010. 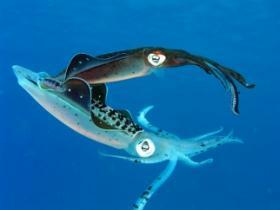 When two male squid fight and become really aggressive, they turn white. 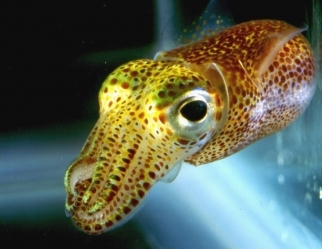 But to court their females, squids prefer to showcase their colorful skin. Oceanographer David Gallo reveals a fascinating phenomena that allows the male squid to romance with his beautiful side while threatening his competition with the white, outward facing side of his body. Rather than thinking about it like a multiple personality disorder, the squid demonstrates various, simultaneous mental states - behavior that seem wildly familiar. We are never in just one state. We have multiple, concurrent moods. We treat different people differently in different contexts at different times. We entertain diverse interests that are both unrelated and concurrent. We have a whole variety of very different friends that we like differently for different reasons in different situations. Our images of ourselves are also multiple, often contradictory and almost always resolvable. We connect and relate to many, diverse, asynchronous brands. Yet, somehow, most brands don't try to speak to the squid in us. Billboards, posters, TV commercials, brochures, trailers, packaging, retail signs: all those highly designed elements that teams of people spend months and millions researching, positioning and refining, may communicate to a part of some of us some of the time in some of the places - but they are usually static and mostly two-dimensional. Having a kinetic skin and a brain allows the squid to identify its audience types swiftly and simultaneously, in order to design instant, even simultaneously conflicting messages for multiple user groups in real-time. Why can't our branded environment do the same? Why can't a Gap ad know to alternate between morning and evening wear depending on the time of day? And why does Nike have only one logo? Can't it transform to be different things to different people in different situations? Why won't yogurt packaging emphasize one piece of relevant data for me and a different piece for you? And why can't a billboard advertise radio stations in the morning, films during the day and alcohol brands at night? Wouldn't both the brands and the media real-estate owners be better served? See David Gallo's TED presentation on the squid and other fascinating underwater astonishments here.